Within the span of a week in July of 1994 two acts of terrorism murdered more than 122 Latin Americans. 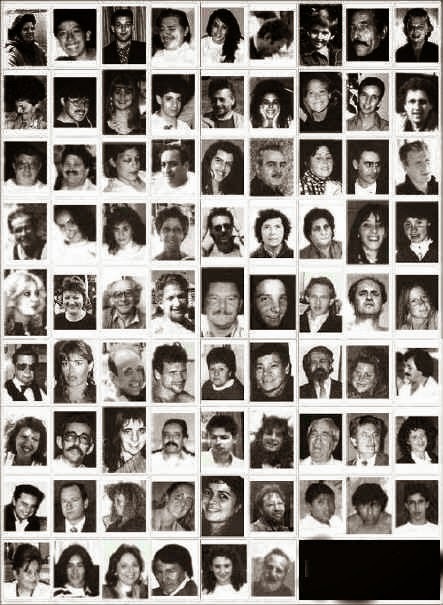 Thirty seven Cubans were murdered by agents of the Cuban government on July 13, 1994 in what amounted to an act of state terrorism and eighty five Argentinians, many but not all Jewish, in an act of terrorism carried out by Hezbollah five days later on July 18, 1994. Over the past week much has been written about the victims of the "13 de Marzo" massacre but today on the eve of the 20th anniversary of the bombing of the Argentine Israelite Mutual Association (AMIA ) building in Buenos Aires the fact that justice has still not been achieved requires speaking out. 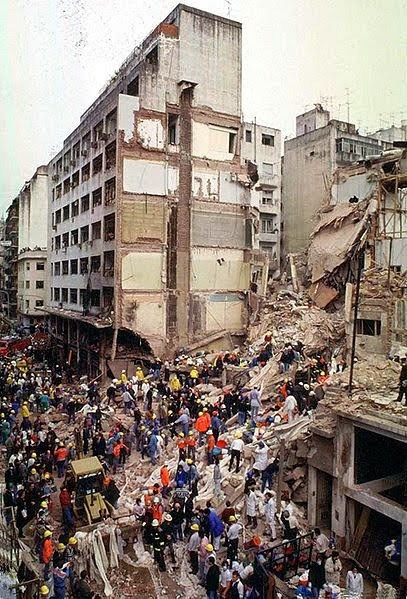 A siren sounded at the precise time the bomb exploded on July 18, 1994 at 9:53am (1253 GMT) and reduced the seven-story Jewish-Argentine Mutual Association (AMIA) community centre in Buenos Aires to rubble reported the BBC. 85 people were murdered ranging in age from 5 years old to 67 years old and more than 300 hundred wounded. 20 years later those responsible for this act of terrorism remain at large. 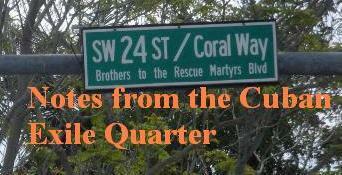 A movement to pay homage to the victims of this crime continues to remember and demand justice two decades later. Silvana Alguea de Rodríguez, Jorge Antúnez, Moisés Gabriel Arazi, Carlos Avendaño Bobadilla, Yanina Averbuch, Naum Band, Sebastián Barreiros, David Barriga, Hugo Norberto Basiglio, Rebeca Violeta Behar de Jurín, Dora Belgorosky, Favio Enrique Bermúdez, Romina Ambar Luján Boland, Emiliano Gastón Brikman, Gabriel Buttini, Viviana Adela Casabé, Paola Sara Czyzewski, Jacobo Chemauel, Cristian Adrián Degtiar, Diego De Pirro, Ramón Nolberto Díaz, Norberto Ariel Dubin, Faiwel Dyjament, Mónica Feldman de Goldfeder, Alberto Fernández, Martín Figueroa, Ingrid Finkelchtein, Leonor Gutman de Finkelchtein, Fabián Marcelo Furman, Guillermo Benigno Galarraga, Erwin García Tenorio, José Enrique Ginsberg (Kuky), Cynthia Verónica Goldenberg, Andrea Judith Guterman, Silvia Leonor Hersalis, Carlos Hilú, Emilia Jakubiec de Lewczuk, María Luisa Jaworski, Analía Verónica Josch, Carla Andrea Josch, Elena Sofía Kastika, Esther Klin, León Gregorio Knorpel, Berta Kozuk de Losz, Luis Fernando Kupchik, Agustín Diego Lew, Jesús María Lourdes, Andrés Gustavo Malamud, Gregorio Melman, Ileana Mercovich, Naón Bernardo Mirochnik (Buby), Mónica Nudel, Elías Alberto Palti, Germán Parsons, Rosa Perelmuter, Fernando Roberto Pérez, Abraham Jaime Plaksin, Silvia Inés Portnoy, Olegario Ramírez, Noemí Graciela Reisfeld, Félix Roberto Roisman, Marisa Raquel Said, Ricardo Said, Rimar Salazar Mendoza, Fabián Schalit, Pablo Schalit, Mauricio Schiber, Néstor Américo Serena, Mirta Strier, Liliana Edith Szwimer, Naum Javier Tenenbaum, Juan Carlos Terranova, Emilia Graciela Berelejis de Toer, Mariela Toer, Marta Treibman, Angel Claudio Ubfal, Eugenio Vela Ramos, Juan Vela Ramos, Gustavo Daniel Velázquez, Isabel Victoria Núñez de Velázquez, Danilo Villaverde, Julia Susana Wolinski de Kreiman, Rita Worona, Adehemar Zárate Loayza. Over the past twenty years much has been written about this crime and on the 20th anniversary interviews, articles and events have and will be carried out to recall that terrible day on July 18, 1994 and the need for truth and justice. Below is a playlist of videos related to the July 18, 1994 AMIA terror attacks. Please share this with others and join in remembering and demanding justice.